So we already know that I'm kind of obsessed with vanilla as evidenced by the fact that I once wrote a haiku about it. Vanilla bean paste was my go-to-ingredient until last December. I discovered I could buy vanilla beans in bulk on E-Bay. Yes, I know you are questioning the quality of e-bay vanilla beans, because I did too. I took a chance so you don't have to, but enough about how sweet I am to you guys. 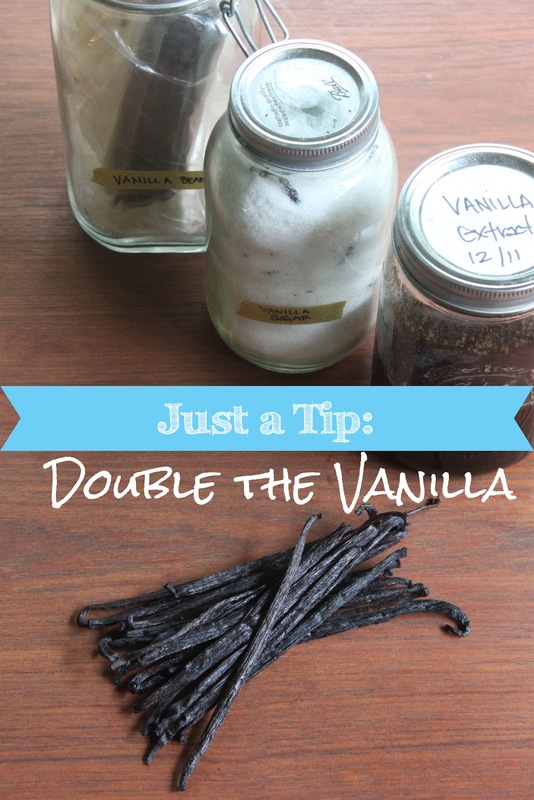 Here is my tip: Buy vanilla beans in bulk. Keep them stored in a zip-top bag in an airtight container in a cool dark space. The first time you split one of those beauties and scrape out the seedy goodness, save the bean. Place half the bean in a large jar of sugar and the other in a jar of bourbon or vodka. In a week you'll have vanilla sugar and in a month or so (once you've added a few more split pods) you'll have vanilla extract. Every time you split a bean, split it between your two jars. Occasionally, add some more sugar to your vanilla sugar and more booze to your extract and you'll almost never run out. Also check out this rad video from Chow on essentially making your own vanilla bean paste. Ooh good idea, thanks for the tip. I must go search for vanilla beans now - in bulk! Clare click on the e-bay link above to see where I purchased my beans. They are super fresh and fragrant - I highly recommend them! Vanilla is the best thing on the planet! Loved your vanilla goodies from Christmas! Well, I guess the cats outta the bag on how to make you're own! We're going to have to think of something different for next Christmas!